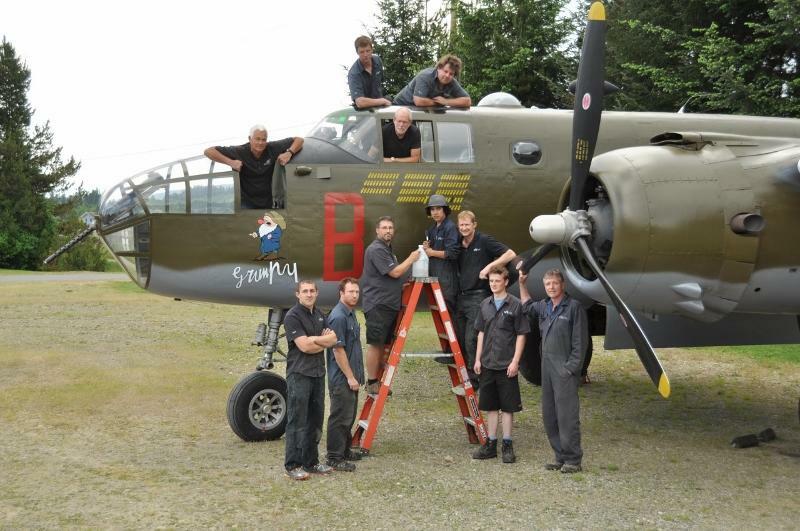 Grumpy, Historic Flight Foundation's B-25- Mitchell Bomber was in our hangar for a paint job. There has been a lot of research and consultation to get the nose art and military markings just right. 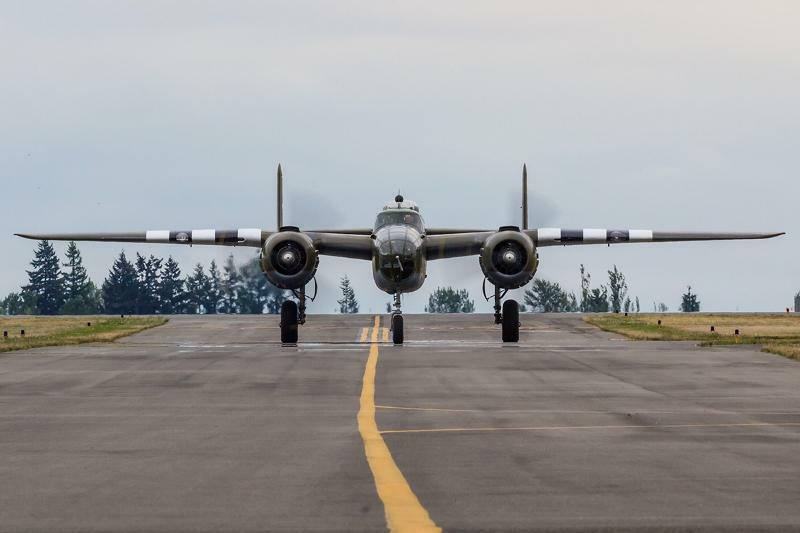 With a wing-span of 67 feet and a loaded weight of 35,000 lbs, the B-25 could take off from short distances at slow speeds. Aviators will tell you the B-25 is a delight to fly, even though it’s got no insulation, no pressurized cabin, and no mufflers (many pilots ended up with permanent hearing loss). As she looked just before leaving Sealand Aviation, and upon arrival at Paine Field. Grumpy’s history began in 1943, training US Army Air Force pilots. In 1944, she was transferred to the Royal Air Force as part of the Lend\Lease program and worked for the Royal Canadian Air Force. Though her work was quiet, she trained crews to fly B-24 Liberators for the critical aerial offensive in Southeast Asia. Post-war, it’s probable that she spent time in storage, but also joined auxiliary bombing units responsible for defending western Canada. She was utilized as a civilian fire bomber in 1967. 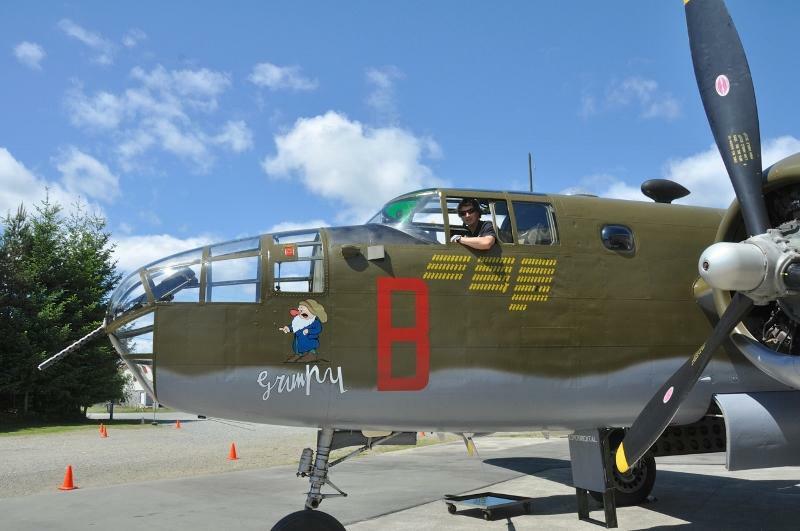 Grumpy could quickly maneuver in and out of deep hot zones and hold up to 1,000 gallons of fire retardant in what used to be her bomb bay, making her one of many B-25s who came out of storage to serve again. Merrill Wien purchased the plane in 1980 and began a full restoration. In 1987, Wien sold the plane to the Duxford Fighter Collection, who completed the restoration. The plane then had RAF markings. 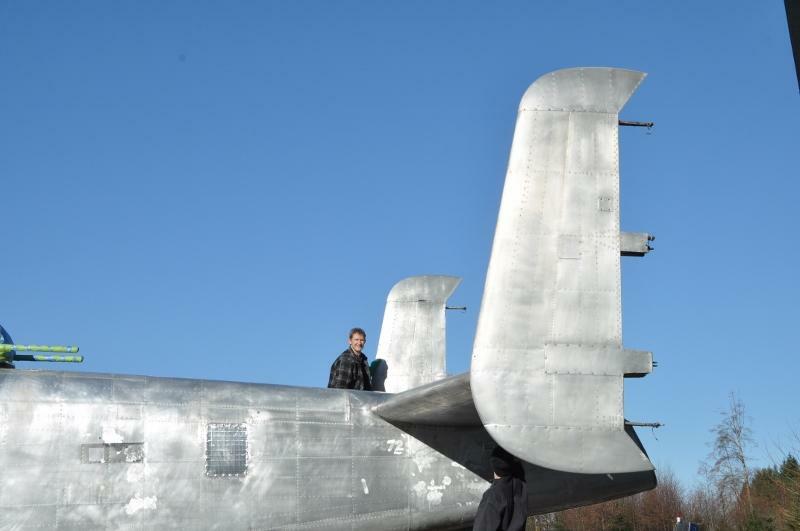 Historic Flight Foundation located at Paine Field near Seattle,Washington, acquired the plane in 2008. They flew her across the Atlantic to honor those pilots who gave their lives delivering planes to the European theater. 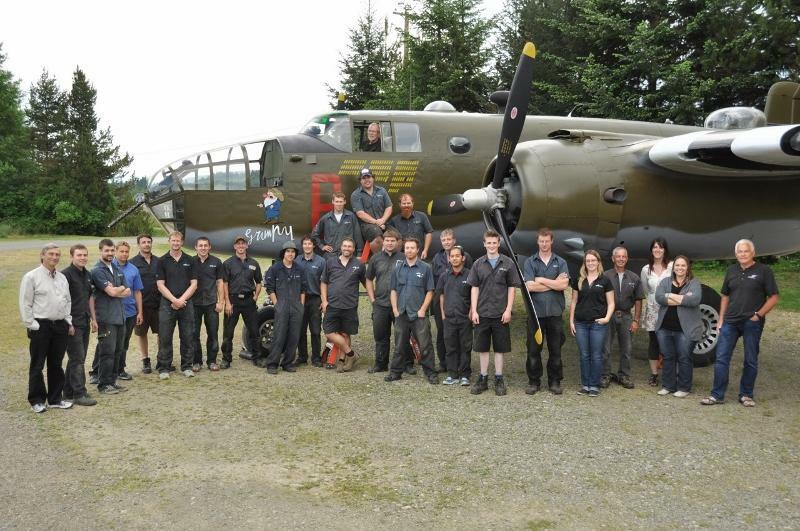 Our crew posed to recreate a picture of the B-25 that was found in the course of our research. All painted and ready to go. Bill Alder took a turn in the pilot's seat. Everyone came out to say good-bye.